What a great new years present! 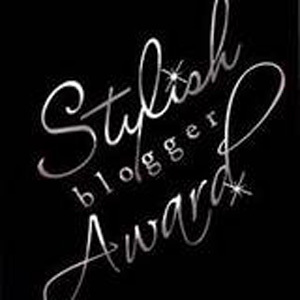 I was selected to recieve the Stylish Blogger Award by Cori from Pretty Haute Mess! Thanks for being so generous with the blogger love, Cori. There are a couple rules in accepting this award...I get to tell you seven things about myself and then I select ten bloggers who I think deserve the award. Suhweet! 2. My favorite food is ramen (see number 5). 3. I have a short toe. 4. I'm singing (along with 249 other people) at Carnegie Hall in 2 weeks! 5. I have an umami / savory tooth - no sweeth tooth here. 6. I've run two marathons and hopefully will do more in the future. 7. I'm designing some fun items to sell in 2011! (stay tuned, I'm keeping them a secret for now). Texasia - yes my dad has a blog! Eclectically Modern - check out Taryn's product reviews!